HomeEntertainmentScore This Dinner & Movie Fandango Promotion! Fandango has a wide variety of gift cards available wide variety of gift cards available and they are the perfect gift to give to your friends and family year around! You can give the fun and adventure with a Fandango Movie Gift Card! In addition, you can also select from the following ongoing promotional offer: 2 Cards: 1 Perfect Night Out! 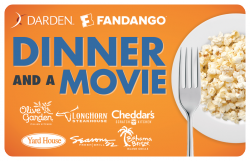 Purchase this $25 Fandango Gift Card + $25 Darden® Restaurant Gift Card. Terms apply. This gift includes one $25 Fandango Gift Card and one $25 Darden® Restaurants Gift Card that will be sent via email. Darden Restaurants Gift Card can be used at any Olive Garden, LongHorn Steakhouse, Bahama Breeze, Season 52, Yard House and Red Lobster in the US. Fandango Gift Card can be used to purchase any movie tickets on Fandango.